The LM staff hit the road in February, covering events in Phoenix, Washington, D.C., and more. The first stop was the Aspire User Conference, held in Phoenix, Feb. 6-8. The inaugural event aimed to help Aspire clients better use the software and technology to run their businesses more efficiently. It did this through presentations from industry experts and group activities. The event drew close to 200 attendees, all of whom are Aspire users. Many of the companies attending had just begun using the software in the last couple of months, while others had been using it since it was launched five years ago. No matter how long a company had been using the software, the goal of the event was simple: bring Aspire users together to talk with other clients, ask questions and hear from industry leaders on how they put technology to work in their companies. LM also attended the first National Association of Landscape Professionals (NALP) Workforce Summit, held Feb. 12-13 in Washington, D.C. The event, sponsored by Caterpillar, brought together 120 landscape professionals from all over the country to discuss the industry’s biggest challenge: labor. “A large percentage of the country is looking for a family-sustaining job and a career path, and that’s what you’re offering,” said keynote speaker, Nick Geale, chief of staff for the U.S. Department of Labor. Sessions at the summit educated attendees about local workforce boards, the benefits of becoming a more diverse company, recruiting veterans and working with schools to host landscape industry career days. One of the major outcomes of NALP’s efforts is the creation of a landscape management apprenticeship curriculum and program, which is registered with the U.S. Department of Labor. The new apprenticeship program aims to raise awareness of the industry and place it on par with other fields with apprenticeship programs, such as construction. Missy Henriksen, NALP’s vice president of public affairs, addressed the 71,000 full-time jobs in the industry that went unfilled in 2017. “The industry must rally together — the problem is too great for even the biggest company in the industry to tackle alone,” she said. The summit closed with an open forum discussion on topics including moving away from the H-2B visa program, retaining workers and unifying the industry’s efforts to grow the workforce. The last stop was Denver from Feb. 20-22 to attend Grow!, an annual event hosted by The Grow Group that aims to help landscape professionals grow their businesses. 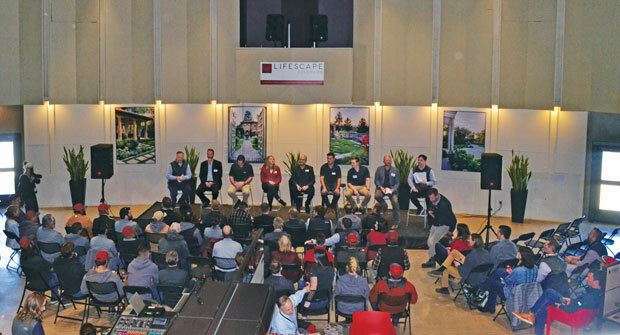 This year, the roughly 350 attendees were treated to a tour of Lifescape Colorado, a landscape design, construction and maintenance company located just outside of downtown Denver. Attendees explored Lifescape’s unique facility — an old church — and heard from members of the firm’s leadership team about their roles in the company and how they foster a healthy company culture. Attendees also heard from speakers such as Marty Grunder, president and CEO of The Grow Group and Grunder Landscaping Co.; Jennifer Lemcke, COO of Weed Man USA; Frank Mariani, owner of Mariani Landscape; LeAnn Ostheimer, director of design and sales at Lifescape Colorado; and Eric Chester, a best-selling author and workplace researcher. LM’s own Bill Roddy also took a turn behind the mic to discuss marketing strategies.